Xcaret is majestic archaeological park located in Riviera Maya, Cancun in the Mexican Caribbean Sea shore. Enjoy a show at night, with more than 300 actors on stage, resulting in a musical journey through the history of Mexico since pre-Hispanic times to the present day, with all the colorful costumes, folklore and dancing. The recreation of a pre-Hispanic ball game, a charro celebration, a Mexican cemetery, a coral reef aquarium, a butterfly pavilion moreover underground rivers, beaches and natural pools, a place where you can swim with dolphins and have fun with countless attractions and activities that will make you live magical experiences. 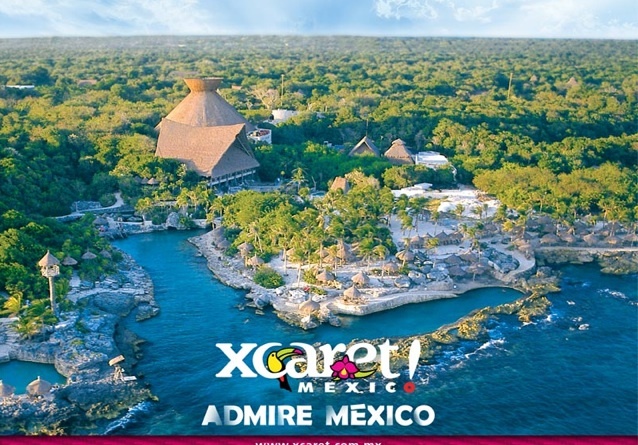 Come to Xcaret, one of the best Cancun attractions, and enjoy while discovering the natural and cultural wealth of Mexico. 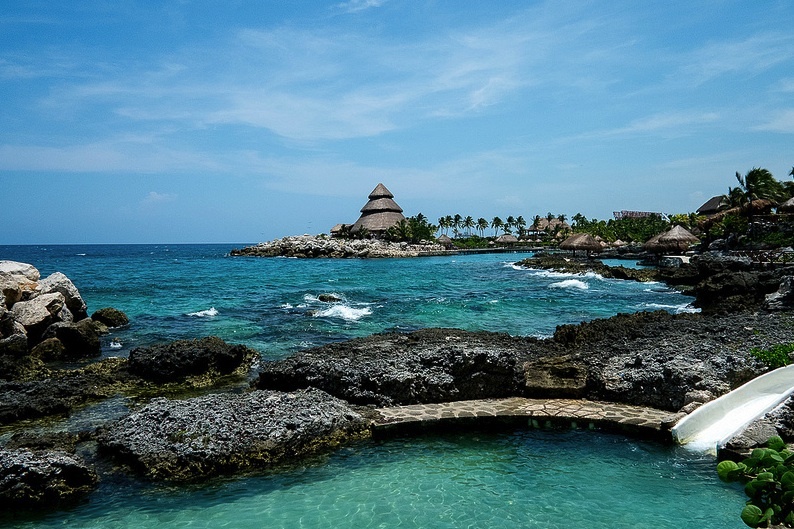 Xcaret Park is Mexico’s sacred paradise. It is a beautiful place full of culture and nature where you can enjoy amazing aquatic activities, cultural attractions, shows and archaeological sites. A space filled with the natural beauty of the Caribbean Sea and the magic of a thousand-year-old civilization. The perfect place to know the best of México its history and traditions, where you and your family will enjoy the best experiences. At Xcaret you will find more than 40 attractions of nature and culture such as a Butterfly pavilion, with native butterflies of the Yucatan Peninsula in their natural habitat, a unique Coral Reef Aquarium; an authentic Mexican Cemetery built cone-shaped with seven levels and 365 different tombs, a henequen hacienda in which interior you will find the Museum of Popular Mexican Art which exposes the ingenious work of Mexican artisans. Take a walk through the Tropical Jungle Trail and know the plants from where the gum, cinnamon and vanilla come from, among others. Admire the views of the sacred paradise of Mexico and Caribbean Sea from the Rotating Scenic Tower, whisper your secrets in the House of Whispers,, marvel at the smells and colors in the Living Museum of Orchids and explore the pristine waters of the underground rivers Xcaret. Live a unique experience with the optional activities such as swimming with dolphins and swimming with sharks and surprise yourself with these wonderful creatures. Go down to the seafloor with Sea Trek® and walk among colorful fish, live the experience of snorkeling on a tour that takes you to a coral reef near the park. 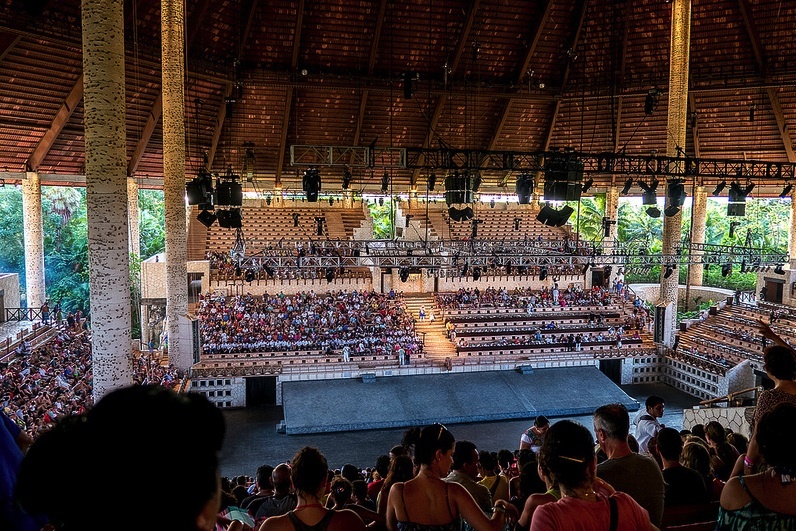 At the end of the day, be amazed with the celebration of Xcaret México Espectacular a musical show that takes you on a journey through the history of Mexico since pre-Hispanic times to the most traditional and typical. Witness a Mayan ball game , and Xcaret Night Show a representation of the encounter of two worlds, and a party full of magic, light and color that will surprise your senses. Come and live Xcaret! Everything in Xcaret leads to unique expressions of joy and excitement … unique expressions of Mexico!